This article is about a hypothetical method of space travel. For other uses, see Hyperdrive (disambiguation). Hyperdrive is a name given to certain methods of traveling faster-than-light (FTL) in science fiction. Related concepts are jump drive and warp drive. A jump drive is a speculative method of traveling faster than light (FTL) in science fiction. Related superluminal concepts are hyperdrive, warp drive and interstellar teleporter. The key characteristic of a jump drive is that it allows a starship to be instantaneously teleported between two points. A jump drive is supposed to make a spaceship go from one point in space to another point, which may be several light years away, in a single instant. Like time travel, a jump drive is often taken for granted in science fiction, but very few science fiction works talk about the mechanics behind a jump drive. There are vague indications of the involvement of tachyons and the space-time continuum in some works. The idea of a hyperdrive in most science fiction relies on the existence of a separate and adjacent dimension most commonly called "hyperspace," though various other names have been used. When activated, the hyperdrive shunts the starship into what appears to be another dimension, where it can cover vast distances in an amount of time greatly reduced from the time it would take in "real" space. Once it reaches the point in hyperspace that corresponds to its destination in real space, it re-emerges. Usually, hyperdrive refers to a method of travel in which it takes a measurable amount of time to go from one point to another. When the distance is covered instantaneously, the term jump drive is often used. Fictional explanations of why ships can travel faster than light in hyperspace often accompany the storyline of novels, television programs, and films in which they are featured. Distances in hyperspace may be smaller than or geometrically inverse in relation to real space; it may provide a shortcut between two points in real space, thus effectively increasing the ship's speed by reducing distance travelled rather than time taken; perhaps the speed of light in hyperspace is not a speed barrier as it is in real space. Whatever the reasoning, the general effect is that ships traveling in hyperspace seem to have broken the speed of light, appearing at their destinations much more quickly and without the time dilation predicted by the Special Theory of Relativity. 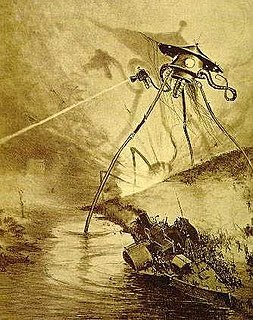 Technobabble, also called technospeak, is a form of jargon that consists of buzzwords, esoteric language, specialized technical terms, or technical slang that is impossible to understand for the listener. Various fields of practice and industry have their own specialized vocabularies, or jargon, that allow those educated within that industry to concisely convey ideas that may be confusing, misleading, or nonsensical to an outside listener. The difference between technobabble and jargon lies with the intent of the user and the audience: a dishonest person might use overly technical language to overwhelm and confuse the audience, masking their dishonesty, while a fiction writer might use it to cover plot holes or to invoke suspension of disbelief of story elements that defy current understandings of science and technology. Use of jargon within technical circles and with no intent to obfuscate is not usually included in the definition of technobabble. the speed of light in a vacuum is the same for all observers, regardless of the motion of the light source. While in hyperspace, spaceships are typically isolated from the normal universe; they cannot communicate with, nor perceive things in real space until they emerge. Often there can be no interaction between two ships even when both are in hyperspace. 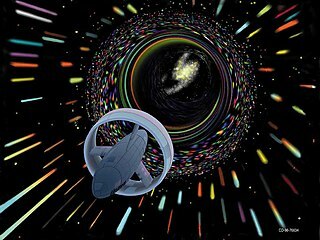 To people traveling in hyperspace, time typically moves at its normal pace, with little or no time dilation; 24 hours in hyperspace equates to 24 hours in real space. This is due to the fact that typical hyperdrive scenarios involve only changing the position of the craft, without altering its velocity (i.e. a ship will emerge with the same momentum, kinetic energy and direction of travel that it had upon entering hyperspace, thereby avoiding relativistic effects). 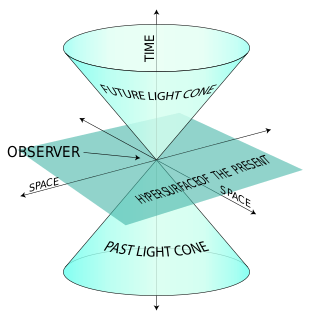 One exception is David Brin's Uplift Universe; here, hyperspace is divided into "levels" where time passes at different rates. Hyperspace, itself, may be portrayed as swirling colors, rapid-moving stars or as something that would drive a human mind insane if viewed by the naked eye. Glen David Brin is an American scientist and author of science fiction. He has received the Hugo, Locus, Campbell and Nebula Awards. His novel The Postman was adapted as a feature film and starred Kevin Costner in 1997. Brin's nonfiction book The Transparent Society won the Freedom of Speech Award of the American Library Association and the McGannon Communication Award. 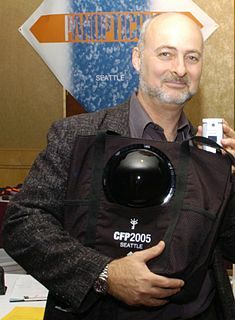 The Uplift Universe is a fictional universe created by American science fiction writer David Brin. A central feature in this universe is the process of biological uplift. In most science fiction, hyperdrive jumps require a considerable amount of planning and calculation, with any error carrying a threat of dire consequences. Therefore, jumps may cover a much shorter distance than would actually be possible so that the navigator can stop to "look around": take his bearings, plot his position, and plan the next jump. The time it takes to travel in hyperspace also varies. Travel times may be in hours, days, weeks or more, and in those cases can provide a setting in itself for a story that takes place during an extremely long journey. In Star Wars, hyperspace travel is portrayed as potentially dangerous due to the chance that the route through hyperspace may take the ship too close to a celestial body with a large gravitational field, such as a star, or a black hole. In such scenarios, if a starship passes too close to a large gravitational field while in hyperspace, the ship is forcibly pulled out of hyperspace and reverts to normal space, or in some stories, is destroyed. Therefore, certain hyperspace "routes" may be mapped out that are safe, not passing too close to stars or other dangers. Other science fiction have hyperspace travel occur outside of normal space, such as in subspace in Stargate SG-1 . Star Wars is an American epic space opera media franchise created by George Lucas. The franchise began with the namesake eponymous 1977 movie and quickly became a worldwide pop-culture phenomenon. Stargate SG-1 is a Canadian-American military science fiction adventure television series and part of Metro-Goldwyn-Mayer's Stargate franchise. The show, created by Brad Wright and Jonathan Glassner, is based on the 1994 science fiction film Stargate by Dean Devlin and Roland Emmerich. The television series was filmed in and around the city of Vancouver, British Columbia, Canada. The series premiered on Showtime on July 27, 1997 and moved to the Sci Fi Channel on June 7, 2002; the final episode first aired on Sky1 on March 13, 2007. Heim theory – A controversial theory of physics that posits for a "real life hyperdrive"
Heim theory, first proposed by German physicist Burkhard Heim publicly in 1957, is an attempt to develop a theory of everything in theoretical physics. The theory has received little attention in the scientific literature and is regarded as being outside mainstream science but has attracted some interest in popular and fringe media. A generation ship, or generation starship, is a hypothetical type of interstellar ark starship that travels at sub-light speed. The technology in Star Trek has borrowed freely from the scientific world to provide storylines. Episodes are replete with references to tachyon beams, baryon sweeps, quantum fluctuations and event horizons. Many of the technologies created for the Star Trek universe were done so out of simple financial necessity—the transporter was created because the limited budget of the original series in the 1960s did not allow expensive shots of spaceships landing on planets. The Alcubierre drive or Alcubierre warp drive is a speculative idea based on a solution of Einstein's field equations in general relativity as proposed by Mexican theoretical physicist Miguel Alcubierre, by which a spacecraft could achieve apparent faster-than-light travel if a configurable energy-density field lower than that of vacuum could be created. The space opera interstellar epic Star Wars uses science and technology in its settings and storylines. The series has showcased many technological concepts, both in the movies and in the expanded universe of novels, comics and other forms of media. The Star Wars movies' primary objective is to build upon drama, philosophy, political science and less on scientific knowledge. Many of the on-screen technologies created or borrowed for the Star Wars universe were used mainly as plot devices. Gravitational time dilation is a form of time dilation, an actual difference of elapsed time between two events as measured by observers situated at varying distances from a gravitating mass. The higher the gravitational potential, the faster time passes. Albert Einstein originally predicted this effect in his theory of relativity and it has since been confirmed by tests of general relativity. Intergalactic travel is the term used for hypothetical manned or unmanned travel between galaxies. Due to the enormous distances between our own galaxy the Milky Way and even its closest neighbors—hundreds of thousands to millions of light-years—any such venture would be far more technologically demanding than even interstellar travel. Intergalactic distances are roughly a hundred-thousandfold greater than their interstellar counterparts. Frontier: Elite II is a space trading and combat simulator video game written by David Braben and published by GameTek in October 1993 and released on the Amiga, Atari ST and DOS. It is the first sequel to the seminal game Elite from 1984. "Slipstream" is a science fiction term for a fictional method of faster-than-light space travel, similar to hyperspace travel, warp drive, or "transfer points" from David Brin's Uplift series. The hypothetical particles tachyons have inspired many occurrences of tachyons in fiction. The use of the word in science fiction dates back at least to 1970 when James Blish's Star Trek novel Spock Must Die! incorporated tachyons into an ill-fated transporter experiment. Interstellar travel is a common feature of fiction such as science fiction and fantasy. Constant acceleration is a proposed aspect of most future forms of space travel. It entails that the propulsion system of whatever kind operate continuously with a steady acceleration, rather than the brief impulsive thrusts used by chemical rockets—for the first half of the journey it constantly pushes the spacecraft towards its destination, and for the last half of the journey it constantly uses backthrust, so that the spaceship arrives at the destination at a standstill. Starship Through Space is a science-fiction novel written by G. Harry Stine under the pseudonym Lee Correy. It was published in 1954 by Henry Holt and Company. The book tells the story of the building of the first starship and of its flight to Alpha Centauri.